Don’t think I will ever roast chicken any other way again. My mom’s new way of preparing her chickens for roasting is to brine them for 24 hours before roasting which results in the chicken being beautifully tender and moist. The hardest part is planning 24 hours in advance that you want roast chicken for dinner. Shame, not sure what happened with this photo - it tasted delicious though. Soak your bird for 24 hours in the fridge. Remove from the brine, pat dry, season and roast as per normal. Et voilà, brined and roasted chicken. Delicious. This entry was posted in Daily Blog, Poultry, Recipes and tagged Brined Chicken, Chicken, Cooking, Food, Recipe, The Complete Cook Book by thecompletebook. Bookmark the permalink. what should I soak the bird in? How simple and yet so lovely a technique! I am definitely going to plan ahead and do this. My niece brined her turkey at Christmas and I couldn’t believe the difference. I hadn’t thought of doing this with chicken:) Brilliant! Have never tried this but I will def be giving it a go – and I think the chicken in the photo looks wonderful! I usually add a few other Ingredients to my brine, but, I always brine roasting chickens. I try to at least marinate Friers in a buttermilk and brine too. Great Post.. I first brined a turkey about 6 years ago and have been brining poultry and pork ever since. It is really amazing how tasty and moist the meat is when prepared this way. I hope others follow you lead, Mandy. They will not be disappointed. Enjoy your day! This looks delicious! We’ve been brining our Thanksgiving turkey for years and it’s hands-down our favorite way to make it. I never thought about trying it with chicken. Yum! Brining chicken is the way to go! It’s a bit more work but you’re right, it makes all the difference. I haven’t done a good, patient brine in awhile. Makes all the difference. Thanks for the reminder Mandy. You’re always so full of inspiration! 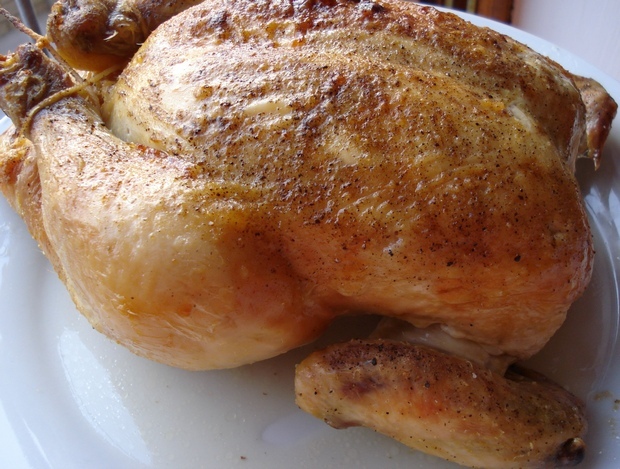 Today I’m buying a chicken so as to try your recipe… If your readers have never tried a brined chicken (or turkey) they have a wonderful surprise in store… Thanks so much for the recipe!!!!!!!!!!!!!! I didn’t realize how easy this was! I have two chickens in my freezer, one of which I will try this with. Love the blog! This is a great recipe. I do like to brine chicken as well as my turkey. It is the planning ahead that causes me to forget! You now have me craving a well roasted chicken!! I would love to try your brine chicken! Looks really tempting! Hope you’re having a great day Mandy! But it’s so beautiful though! You won’t cook again? I’d love to see it when the chicken comes out this gorgeous! I thought you weren’t supposed to brine a whole chicken for more than 8 hours maximum, or they get too salty. Is yours able to brine for 24 hours because you use a much lower salt ratio?